As the second half of “the year of the offensive” opened in I CTZ, not much had changed along that critical front. COMUSMACV conceded that “while we continued to gain momentum in both our clearing operations and strikes against the enemy's main forces, we were compelled either to build up our forces near the DMZ or to lose the northernmost provinces to increasingly large North Vietnamese forces.” In particular, Westmoreland worried about the old imperial capital of Hue—a very reachable political and psychological objective which would be left wide open should a go-for-broke NVA offensive smash through the already thinly stretched line of U.S. Marines. The enemy seemed to be gaining in strength; so much so that Westmoreland had reluctantly formed sundry army units into Task Force OREGON to deal with the southern portions of the CTZ, allowing the marines to devote full attention to the war along the DMZ. COMUSMACV was keenly aware that “the proximity of the enemy's sanctuary and his artillery and mortar fire” made operations in and around the DMZ “particularly bloody.” And bloody it was, for both sides. From mid-May to mid-July, three ground operations cost 316 Marine KIA and well over two thousand wounded. The Leathernecks in turn counted precisely 2,394 enemy corpses. South of the demarcation line the marines, opposed to the anti-infiltration barrier scheme all along, reluctantly began work on the Strong Point Obstacle System (SPOS) segment of the “McNamara Line.” (See "Supporting the Marines.") The strong point fortifications “were to serve as both patrol and fire support bases. On-call, preplanned artillery fires were to cover the entire area, and tactical aircraft were to be available on short notice for support.” All non-combatants would be removed and relocated, making the area a free-fire zone. Reaction forces would be stationed a short distance to the rear, ready to quickly deploy as needed. In mid-1967, the enemy renewed his focus on the outcropping of Con Thien, picturesquely if perhaps inaccurately translated as “Hill of Angels.”1 The strongpoint there was the western anchor of the SPOS and one terminal of “the trace,” a scraped-bare no man’s land, 600 meters wide, stretching over to Gio Linh, 8 or 10 miles to the east. As the summer wore on the bombardment increased, including shelling from long range 130mm cannons which the marines' counter-battery fire could not reach. By September the SPOS outposts were taking a thousand or more incoming rounds a day, while ground action continued unabated. 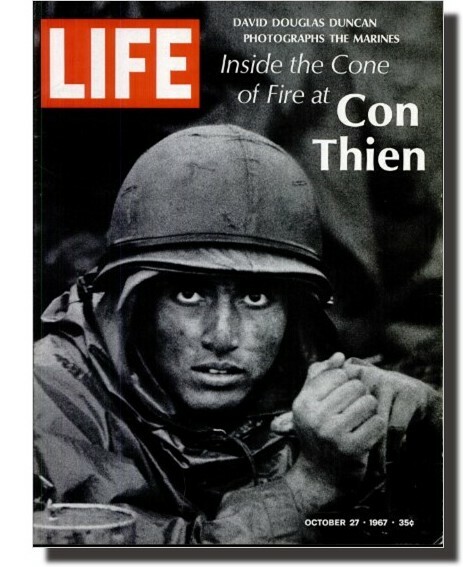 Con Thien was all but surrounded. By mid-September, the situation had become critical. To break the siege, Seventh Air Force proposed to lay on a “SLAM” operation to destroy the enemy artillery and rocket launching sites. The SLAM acronym described activities meant to Seek concentrations of enemy forces, Locate specific targets identified by all-source intelligence, Annihilate enemy forces, equipment, and installations so identified, then Monitor afterwards to deny the enemy further use. ARDF was one of the several tools employed in the "seek" and "locate" phases of SLAM. Annihilation of the selected targets would be accomplished by B-52 ARC LIGHT strikes, followed by TACAIR as necessary. Recon aircraft and MACSOG's cross-border PRAIRIE FIRE teams would monitor the results. Friend and foe alike were well aware of the terrifying punch packed by the B-52, but lack of accurate and timely post-strike bomb damage assessment (BDA) often prevented objective evaluation of the effectiveness of ARC LIGHT missions. In hopes that the enemy himself might provide clues, COMUSMACV tasked the DRILL PRESS operation, recently renamed SENTINEL SARA, to listen in on voice transmissions made during and after strikes around the DMZ. For this special mission, a highly qualified Vietnamese linguist from the 6988th Security Squadron was requested by name. During the 14-day tryout, 29 messages relating to the B-52 missions were copied, including reports of damage and casualties. To what use this unusual intelligence may have been put is unknown. To relieve the pressure on Con Thien, a SLAM Operation named NEUTRALIZE took wing on 11 September. Over the next six weeks no less than 176 ARC LIGHT missions, totaling 3,872 sorties, were fragged against targets in and around the DMZ, including some just inside North Vietnam. Concurrently, the Marines launched Operation KINGFISHER. The jarheads would take out the NVA the old fashioned way, but it would be tough going. B-52s dropped 7,744,000 tons of bombs in support of this ground operation alone. Another 3,836,000 tons would be delivered in support of the follow-on Operation KENTUCKY, which ran into 1968. More than three thousand TACAIR sorties, slightly more than of half of them Marine fighter-bombers, added to the mayhem. TACAIR strikes were hampered by bad weather and poor communication and cooperation between USAF and USMC components, while the grunts complained about having to check artillery fire, often at critical times, due to air activity. In the end, MACV historians concluded that “Although the goals established for Operation NEUTRALIZE were not achieved, it was considered an effective project.” The enemy had been forced to disperse his artillery and many fighting positions and prepositioned supply caches were destroyed. Large concentrations of troops invited death by B-52. By early November, the combination U.S. air attacks, bloody ground battles, and the onset of the rainy season had worn the NVA down. His direct path across the DMZ at least temporarily blocked, the enemy turned his attention westward towards the expansion and improvement of the arteries of the Ho Chi Minh Trail running along the border into Laos. SIGINT began to detect signs of a renewed enemy buildup along Route 9 near Khe Sanh, where ARDF fixed subordinate units of the NVA 304th Division as well as elements of the 320th Division. The SPOS represented only a portion of the anti-infiltration barrier, eventually taking on the codename DYE MARKER.2 Farther west, fields of seismic and acoustic sensors would be sown, either by dropping from aircraft or hand-planted by ground troops. In theory, signals from the sensors would be picked up by an orbiting Airborne Battlefield Command and Control Center (ABCCC) which would then direct air strikes against the entities that had triggered the sensors. Initially called MUSCLE SHOALS, this phase of the program would undergo several name changes over time. The MUSCLE SHOALS area was further subdivided into anti-personnel and anti-vehicular zones, the primary operational difference being the type of sensor deployed. The SPOS, which was never completed, proved to be neither super strong nor an insurmountable obstacle. The sensor fields, while not the technological game changer it’s architects hoped for, nonetheless did in time provide useful intelligence in battles yet to come. In September, ASA’s 8th RRFS at Phu Bai conducted tests to compare low level enemy voice intercept results in the DMZ area obtained from ground sites against output from the SENTINEL SARA birds. (“Low level” in this case meaning local tactical radio transmissions.) The SENTINAL SARA intake was “far greater than expected.” Virtually from the inception of the Air Force’s ARDF program, Electric Goons had worked the STEEL TIGER interdiction area of eastern Laos. In December, NSA advised that a specific need existed to determine enemy reaction to and possible countermeasures against the anti-infiltration barrier. “Z” configured EC-47s would now operate against low level VHF voice targets in the MUSCLE SHOALS areas. Regularly scheduled missions would continue as before but ARDF capability in the VHF band did not yet exist; voice traffic would be intercept only. Linguists remained in short supply throughout much of the 6994th’s existence; additional personnel were sent TDY from other USAFSS units. As had been previous practice, the “take” was dropped off at Phu Bai for transcription and exploitation. The results revealed nothing about enemy awareness of MUSCLE SHOALS, but voice intercept would remain a mission priority. In December a rather bizarre incident occurred that would further involve COMPASS DART. A MUSCLE SHOALS acoustic sensor transmitted the conversations of the NVA troops who had discovered it, whereupon MACV seized upon the idea of “bugging” enemy base camps with these devices. A sensor was duly acquired by the 6994th and both EC-47 “Z” and SENTINAL SARA aircraft attempted to pick up its signal. Results proved negative and the scheme was dropped. As the 3d Marine Division countered what amounted to a conventional invasion along the DMZ, the 1st MARDIV, now partnered with the army’s Task Force OREGON, continued to seek out the enemy in the lowlands of the southern part of I CTZ. A pair of ARVN divisions and a brigade of ROK Marines rounded out allied forces, whose principal mission was to protect the Marine base at Chu Lai and to shield pacification efforts in areas where, aside from a few secure enclaves along the coast, much of the population had been under communist control for years. Hiding out in the mountains to the west was the 2d NVA Division, joined on occasion by elements of the 3d NVA Division moving up from II Corps. There were in addition several independent enemy battalions and companies, supported by numerous local guerilla units throughout the area. In mid-July one such outfit, the 324B NVA Artillery Regiment, lobbed an estimated 83 122mm rockets into Da Nang airbase, killing 8 USAF personnel and wounding more than a hundred others. Ten aircraft were destroyed, another 49 damaged. 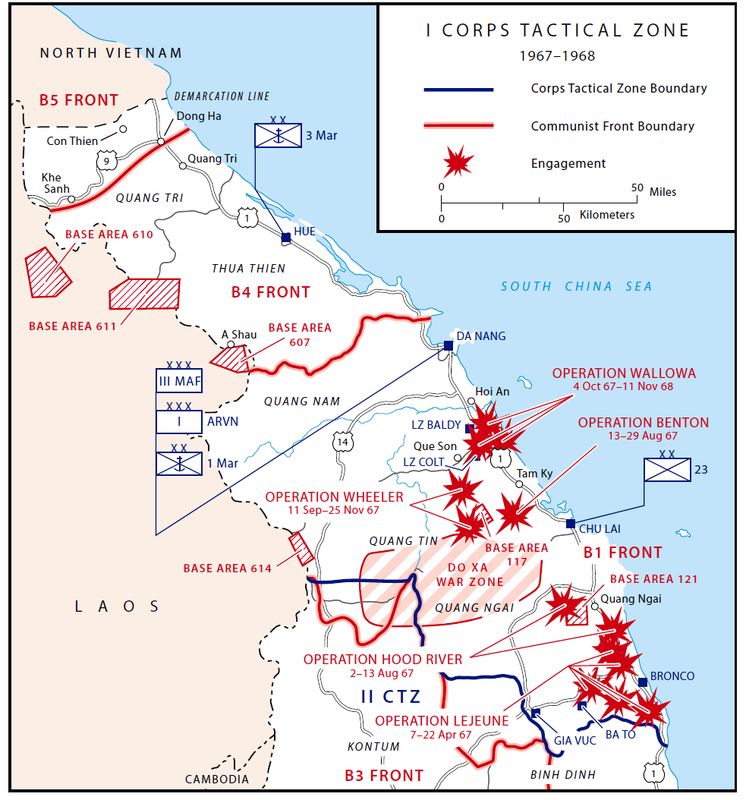 The map at right shows (a) the locations of major allied headquarters in I CTZ: 3d MARDIV at Hue; III MAF, ARVN I Corps, and 1st MARDIV at Da Nang; and the Americal Division at Chu Lai, (b) enemy base areas, and (c) approximate areas of major allied operations in the southern sector of the zone. Not shown is Operation MALEUR, kicked off by TF OREGON in May along the far southern edge of the CTZ, which yielded only sporadic contact with the targeted 2d NVA Division.3 A three-month continuation was likewise characterized by small unit actions. Nonetheless, the OREGON troops claimed over 850 enemy dead for 81 of their own. The enemy’s grip on the rural populace had been loosened considerably, making life difficult among the guerilla infrastructure upon which so much depended. The 6994th histories for July-December shed very little light on specific COMPASS DART contributions to allied ground operations during this period, but do note that 36 sorties totaling 152 flying hours were devoted to MALEUR. Both army and marine commands reported that they were “well supported” by both the Nha Trang (Det. 1) and Pleiku (Det. 2) detachments. Immediately following Operation MALEUR came HOOD RIVER, a joint U.S./ARVN/ROK operation intended to trap two regiments of the 2d NVA Division before they could launch an anticipated attack on Quang Ngai City. Task Force OREGON would helicopter airmobile units to the west of the enemy, while the Korean Marines and ARVN pinched in from north and south, respectively. HOOD RIVER, scheduled for only 11 days, yielded such meager results (with only 3 U.S. KIA) that it was suspected the operation had been compromised—or that the entire set-up was an enemy ruse to draw allied forces inland so that coastal targets could be more easily attacked. Whatever the case, the carefully planned operation was supported by 38 EC-47 missions. The search for the elusive NVA regiments now turned toward the enemy’s Base Area 117 in the country southwest of Chu Lai. Two weeks of Operation BENTON, occupying five battalions and consuming 800 tons of air-delivered ordnance, resulted in over 300 U.S. casualties, including 41 KIA, but again failed to produce decisive results. Only nine COMPASS DART sorties were flown in support; results not stated. Operation WHEELER, later expanded by combining with other forces from Operation WALLOWA along the coast east of Highway 1, would fight the 2d NVA Division into the early months of 1968 with largely inconclusive results. Exactly what the 44 COMPASS DART missions flown in support of these operations accomplished will likely never be known. Eventually the Americal Division would claim over 1,400 enemy killed. About half these were identified as NVA regulars. The rest, presumably, were guerillas and local communist militia. The following spring the Americal’s math—and methods—would come under severe scrutiny at a place called My Lai. 1. Click here to view details on the battles around Con Thien, including a CBS News special report from 1967. 2. The July 2017 timeline contains more details on the anti-filtration system. 3. The June 2017 timeline featured Operation MALHEUR. Click here for sources upon whith this article is based.